Thomas Sowell on Left Wing Fascism-Is There Any Other Kind? A review of Jonah Goldberg's "Liberal Fascism", from Hoover Institute Fellow Thomas Sowell. 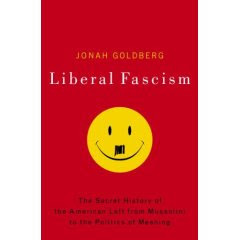 Those who put a high value on words may recoil at the title of Jonah Goldberg's new book, "Liberal Fascism." As a result, they may refuse to read it, which will be their loss -- and a major loss. Those who value substance over words, however, will find in this book a wealth of challenging insights, backed up by thorough research and brilliant analysis. This is the sort of book that challenges the fundamental assumptions of its time -- and which, for that reason, is likely to be shunned rather than criticized. Because the word "fascist" is often thrown around loosely these days, as a general term of abuse, it is good that "Liberal Fascism" begins by discussing the real Fascism, introduced into Italy after the First World War by Benito Mussolini. The Fascists were completely against individualism in general and especially against individualism in a free market economy. Their agenda included minimum wage laws, government restrictions on profit-making, progressive taxation of capital, and "rigidly secular" schools. Unlike the Communists, the Fascists did not seek government ownership of the means of production. They just wanted the government to call the shots as to how businesses would be run. They were for "industrial policy," long before liberals coined that phrase in the United States. Indeed, the whole Fascist economic agenda bears a remarkable resemblance to what liberals would later advocate. Moreover, during the 1920s "progressives" in the United States and Britain recognized the kinship of their ideas with those of Mussolini, who was widely lionized by the left. Famed British novelist and prominent Fabian socialist H.G. Wells called for "Liberal Fascism," saying "the world is sick of parliamentary politics." Another literary giant and Fabian socialist, George Bernard Shaw, also expressed his admiration for Mussolini -- as well as for Hitler and Stalin, because they "did things," instead of just talk. In Germany, the Nazis followed in the wake of the Italian Fascists, adding racism in general and anti-semitism in particular, neither of which was part of Fascism in Italy or in Franco's Spain. Even the Nazi variant of Fascism found favor on the left when it was only a movement seeking power in the 1920s. W.E.B. DuBois was so taken with the Nazi movement that he put swastikas on the cover of a magazine he edited, despite complaints from Jewish readers. Even after Hitler achieved dictatorial power in Germany in 1933, DuBois declared that the Nazi dictatorship was "absolutely necessary in order to get the state in order." As late as 1937 he said in a speech in Harlem that "there is today, in some respects, more democracy in Germany than there has been in years past." In short, during the 1920s and the early 1930s, Fascism was not only looked on favorably by the left but recognized as having kindred ideas, agendas and assumptions. Only after Hitler and Mussolini disgraced themselves, mainly by their brutal military aggressions in the 1930s, did the left distance themselves from these international pariahs. Fascism, initially recognized as a kindred ideology of the left, has since come down to us defined as being on "the right" -- indeed, as representing the farthest right, supposedly further extensions of conservatism. If by conservatism you mean belief in free markets, limited government, and traditional morality, including religious influences, then these are all things that the Fascists opposed just as much as the left does today. The left may say that they are not racists or anti-semites, like Hitler, but neither was Mussolini or Franco. Hitler, incidentally, got some of his racist ideology from the writings of American "progressives" in the eugenics movement. Jonah Goldberg's "Liberal Fascism" is too rich a book to be summarized in a newspaper column. Get a copy and start re-thinking the received notions about who is on "the left" and who is on "the right." It is a book for people who want to think, rather than repeat rhetoric. Um, what about the violent response of fascists (both states and organisations, in the entire 20th C) against communists? What about the mass persecution, the killing and imprisonment of unionists and communists? This conclusion can only be maintained through sustained and deliberate ignorance of 20th century history. Once again, this is classic taint by association, which is after all the modus operandi of this blog. If some socialist admires Hitler and Mussolini, then Mussolini and Hitler are left wing. What does that prove George? Communists killed Trotskyists and anarchist in Spain. Naxalites kill CPIM members in Bengal today. The fact fascists killed communists doesn't prove they are ideological opposites. Communists and fascists are like mafia clans-warring over turf when it suits, forming alliances when it suits. Communists and fascists are similar in more ways than they are different. The fact that they often war is irrelevant. So Mussolini and Uncle Adolf were anarchists just like Asher Goldman is today.Gee Asher wont like this. There's no dispute that fascist ideology had roots in both leftist and right-wing thinking, but I think this piece rather glosses over the historical reality that opposition to fascism, whwether in Italy, Germany or Spain, came from the left rather than the right. This opposition wasn't something that only surfaced in the 1930s as this piece claims. Tossing in examples such as H G Wells is just an attempt to muddy the waters as Wells was a political oddity, having quickly broken with the Fabians to demand an anti-democratic world government by scientists his influence on the left rapidly declined, and consequently, he's chiefly remembered for writing fantasies about Martian invasions. To give him credit, he become a staunch opponent of Naziism well before this stance became popular with the British political establishment. In Italy Mussolini's opponents were people like socialist Giacomo Matteotti and anarchist Gino Lucetti and in Germany Horst Wessel was shot by a communist party member. While the left was fighting and dying in Spain, conservatives were cheering for Franco. Churchill, for example, spoke very favourably of Mussolini and only changed his tune in the face of massive German rearmament, the bulk of the British conservative party followed their leader Neville Chamberlain's policy of appeasement right up to the last minute. Obviously, fascism is ideologically at odds with modern free-market libertarianism, but the latter has yet to show itself as an effective opponent of fascism in practice, rather than simply in theory. There's also the fact that Fascism is very comfortable with vast disparities in wealth, and socialists aren't. At Last, A Plausible 9/11 "Conspiracy Theory"
Wellington Anarchists to Defend "Urewera 17"